The first thing I have been noticing is what I like to call the octopus effect . . . when we are feeling pulled in numerous ways with many valid possibilities. We might feel a deep desire to create in multiple directions all at once; yet we are still in the dilemma of being in one physical body with all its 3D limitations . . . at least for now. On top of all this abundant push to create and manifest all the possibilities presented to us, we are also feeling quite apathetic about absolutely everything. It looks like any attachment to our beliefs systems are floating out in a field of possibility without ego attachment, and we are waiting to see what stays with us and what will dissolve away. I think this is the beginning of a new foundation stone to cosmic multi-tasking . . . spherically manifesting . . . while staying in a neutral and detached ego. There is a lot to learn in this new energy. When huge cycles complete, like the one that just ended, it goes out in an explosive blaze of fever pitched, frantic and intoxicating energy. When cycles build up enough energy, they catapult us into another cycle/dimension/reality. It is like starting over in a new beginning as we leap from one completing spiral to the beginning (bottom) of a new spiral in time. 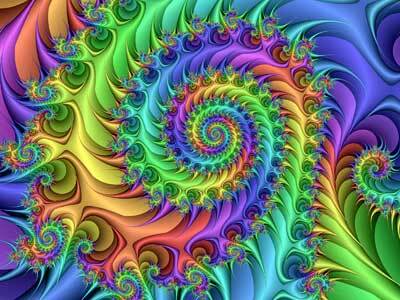 The best way to describe this leap is with fractal art (see graphics), yet it still misses the spiral visualization. The Maya knew about these huge launches into new realties even though they had lost the actual date (You might want to search on YouTube fractal spiral visualizations), BUT with that said . . . we sure felt this shift on December 22, 2012 and again around January 2-3, 2013. Now we are in an adjustment period. New cycles, like the one we just entered, begin nice and slow with lots of surreal, dreamlike space in which to make conscious choices that will become the foundation stones for this entire new cycle. At first the world might feel flat as a pancake and lacking energy. Many people are sharing with me that they are missing the buzz of 2012, and the world now feels a bit mundane. We are literally being asked to go "cold turkey" on breaking our addiction to really high pitched energies from the past cycle that we had become accustomed to. This is an adjustment as we let go of the drama and ego which we were accustomed to. Others are making huge adjustments in their lives to self-correct and come into alignment with this new cycle and field of possibility. This takes raw and instinctual courage. 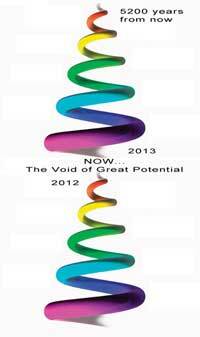 We are in a period of a great void of huge potential, and we are adjusting to this space. We are in a phase of orientation and discovery. The orientation point that has been anchored in each of us in 2012 is now being slowly switched on. We can take our time about everything in our lives. There is lots of time to fulfill your destiny and divine purpose. We can slow down and breathe the unqualified air in this new reality. But as you see . . . it is going to take some getting used to. For me, I am loving the space around me after what was quite a frantic and exciting year, but continue searching and keeping my eyes open.